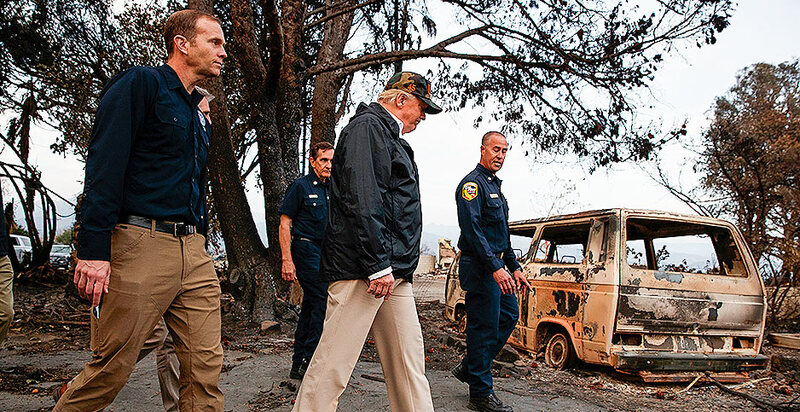 On a visit to California over the weekend to view damage from two deadly fires, Trump said he'd learned in a conversation with Finnish President Sauli Niinistö that the Scandanavian country takes care of its forests in part by raking the floor — an assertion Niinistö later disputed. "He called it a forest nation," Trump said, "and they spent a lot of time on raking and cleaning and doing things, and they don't have any problem." The comment about raking quickly became fodder for criticism and came on top of remarks the president had made about overgrown forests and the Camp Fire north of Sacramento, even though that fire is more urban in nature. Punchlines aside, Trump was getting at what may be the central debate in forest policy lately: How aggressively should forests be cleared of brush and dead or dying trees in order to prevent catastrophic fires? And should environmental laws be relaxed at times to allow more of that activity? The dust-up over the raking comment is a bit of a distraction, said Eric Holst, associate vice president for working lands at the Environmental Defense Fund, in Sacramento. "I think it's much more complicated than that," he said. For starters, Holst said, the conversation varies based on where the fire occurs. Debates over how to manage wildfire on timberlands are different from those about wildfire management in developed areas, like where the Camp Fire is raging, or in wine country. In heavily forested areas, revenue from timber can help offset costs of forest-thinning, he said. But in developed areas in the foothills, fuels management is "pure cost," Holst said, meaning the government takes on the expense. Management of hazardous fuels in those areas, he said, is largely a deferred cost. "These are not commercial timberlands," Holst said. In forested regions, experts disagree about how much — and where — forests should be thinned. The John Muir Project, working in the Sierra Nevada, has argued against harvesting trees in previously burned areas, for instance, saying logging increases the odds of subsequent fire. But many environmental groups say they agree with policies that would remove more dead and dying trees in the interest of preventing the most severe fires. All sides appear to agree that some fire, at least when managed, is necessary for forests to regenerate. The distinction between types of land, lost in the buzz over Trump's comments, is important, said a timber industry source. "Because the land is in small tracts — meaning decisionmaking is dispersed — and with no biomass plants, the vegetation has little value, and it's very difficult to get individual landowners to take on the expense of managing these lands," the source said. Federal policy comes into play in national forests, where conditions are worse, the timber industry source said. "This is the result of drastically reduced harvest in the 1990s that was done ostensibly to protect habitat and watersheds. This has led to overstocking and mortality, undoubtedly exacerbated by climate change," he said. "The biggest threats to wildlife habitat and the health of California's watersheds, is from large, uncharacteristic wildfires." The Sierra Club, seizing on comments by Trump and Interior Secretary Ryan Zinke, criticized the leaders in a statement. "We need strong, science-based leadership from our elected leaders — not factless tweets and unfounded theories from Donald Trump and Ryan Zinke — to limit the damage from fires fueled by climate change and to protect vulnerable people, places, and wildlife," the group said. "The long-term safety of our communities depends on science-based action and dedicated funding that adequately supports firefighting and forest management efforts."